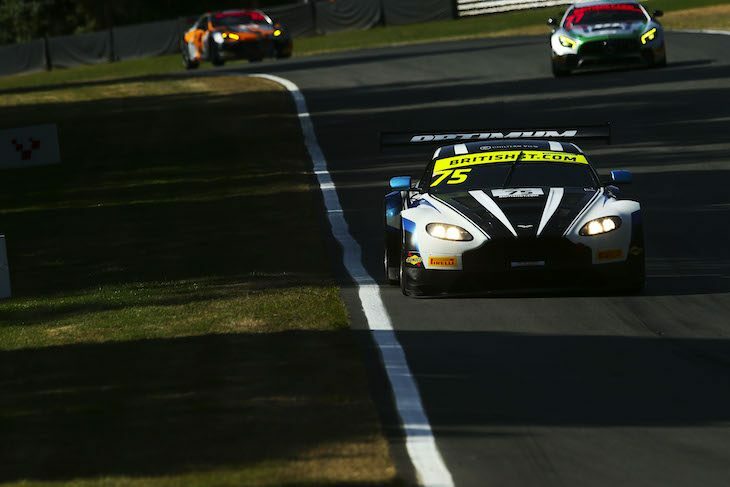 Optimum Motorsport’s Flick Haigh and Johnny Adam took another British GT pole position in the #75 Optimum Motorsport Aston Martin at Brands Hatch on Saturday. Times of 1:27.347 from Haigh and 1:25.182 from Adam were enough to ensure the car’s position at the head of the field for Sunday’s two-hour race around the full Grand Prix loop. They’ll be joined on the front row by another Aston Martin, the Beechdean entry of Andrew Howard and Darren Turner, which qualified third ahead of the Jon Minshaw/Phil Keen Lamborghini. Spa winners Graham Davidson and Maxime Martin complete the second row of the grid in the Jetstream Aston Martin, while Sam de Haan and Johnny Cocker qualified fifth in the other Barwell Lamborghini. A spin on a hot lap during the Pro driver session for Calum MacLeod at Hawthorns in the #7 Team Parker Bentley prevented further improvement from that car, which qualified sixth ahead of the Mowle/Buurman Mercedes and Parfitt/Ratcliffe Bentley. Elsewhere, Marco Sorensen saw a wheel part company with the #17 TF Sport Aston during his session, but he retained control of the car, got back to the pits and was able to get a flying lap in at the end. When combined with Derek Johnston’s effort in the Am session it was only good enough for the car to qualify ninth, however. Earlier, the Am driver session had barely got underway when the red flags flew for a car stuck in the gravel at Paddock Hill Bend – the #11 TF Sport Aston Martin, with Mark Farmer at the wheel. Although not seriously damaged, the car took no further part in the session and thus lines up 10th and last in GT3. The pair of Century Motorsport BMWs locked out the front row of the GT4 pack, having been dominant in the first session and strong enough in the second. In the first (Amateur driver) session, MacDonald did his job and gave Mitchell the best possible chance of securing pole in what could be a title-deciding race on Sunday. His best was a 1:33.273. Ben Green was there just behind with a 1:33.286 in the #42 sister car. The pro session (which includes the other silver driver in a silver-silver pairing only ever saw the first two spots traded (several times in fact) between the BMWs but it was the #43 that prevailed with a combined time of 3:06.045. The Academy Aston Martins qualified third (#61) and fifth (#62) and were on the pace throughout, Tom Wood making amends for an excursion in practice with the third fastest time in the first session (1:33.426). In terms of the other protagonists for the GT4 drivers title, Fagg and Matthiesen were fourth and fifth quickest in session one and it was the #4 Tolman McLaren that O’Brien eventually managed to haul to a fourth-place grid spot, Pointon put the #55 HHC Ginetta sixth. Richard Williams made a strong return in the Steller Motorsport Toyota GT86 with a 1:34.280, seventh quickest in the first qualifying session and Sennen Fielding posted a highly competitive 1:33.134, showing that the Toyota has certainly found some pace and gives Steller Motorsport pole in the Pro-Am category. The quickest driver overall was Scott Malvern with a 1:32.605. There was no #56 Tolman Motorsport McLaren for either of the GT4 qualifying sessions as the car needed an engine change after a failure in practice.